New Note! From shaz-knitz, who supplied the picot bind-off option: to make the edge lie flat, she did 5 rows of rib before the picot bind off. 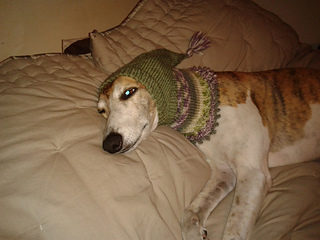 Yet another way to pester your sighthound. 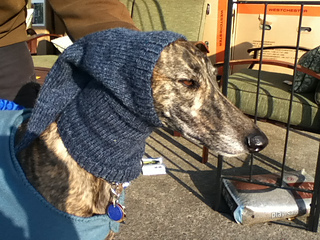 This is a little hood style hat that covers down the neck as well, and has a fun pointy hood-like section behind the head. A number of different ways to finish the neckline are given. 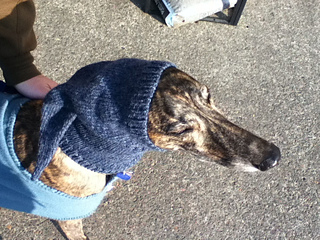 Knit in one piece with no seaming. 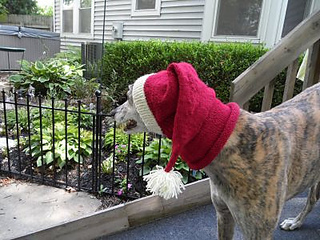 This pattern was written up in a fit of enthusiasm for the Greyhound Knits group on Ravelry. It’s free for personal use (no selling the pattern! 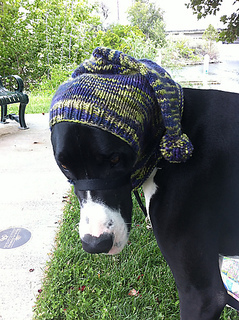 Really, who would sell a free pattern anyway?). Feel free to make as many as you’d like to benefit hound rescue groups (or any animal rescue group), and I’d love if you’d consider donating some portion of money made from commercial sales of the finished product to a rescue group or shelter.